Did you know your thyroid gland makes hormones that help control the function of many of your body’s organs, including your heart, brain, liver, kidneys, and skin? Making sure that your thyroid gland is healthy is important to your body’s overall well-being. An estimated 15 million of Americans have undiagnosed thyroid problems. 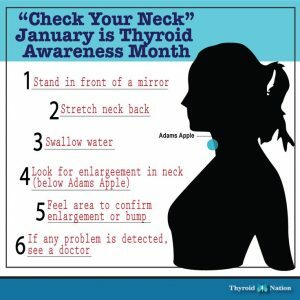 You can perform a simple self-examination to help with early detection and in some cases, help you find lumps or enlargements in the neck that may point to a thyroid condition. 1. Hold the mirror in your hand and focus on your thyroid gland, which is located in the front area of your neck, above the collarbones below the voice box (Adam’s apple). 2. While focusing on this area in the mirror, tilt your head back. 3. Take a drink of water and swallow. 4. As you swallow the water, look at your neck. Check for any bulges or protrusions in this area when you swallow. You may want to repeat this step several times. 5. If you see any bulges or protrusions, consult your physician.